This edition of the celebrity antiques challenge sees the Apprentice stars Nick Hewer and Margaret Mountford become rivals as they travel around the south of England. Browse content similar to Nick Hewer and Margaret Mountford. Check below for episodes and series from the same categories and more! We are special then, are we? ..and a classic car. Their mission? I've no idea what it is. Would anybody follow expert advice? of even the hardest entrepreneur. it's Margaret Mountford and Nick Hewer. Do you know anything about antiques, at all? it's about product selection, Margaret. -so you spread your risk. That's way we shouldn't just spend it all on one thing. and damning way with words. you don't like talking about money. -No. And I don't bargain. -You're not going to bargain? No, I'm not. I hate bargaining. I hate bargaining! -Well, you're going to have to overcome that. and Nick was a PR impresario with his own business. and is also on the helm at Countdown. focusing on burning issues of the day alongside her old pal Nick. halfway across the country to find somebody else who'd like it. An impressive pair, needs an impressive car. a 1976 Rolls-Royce Silver Shadow. It's a big sluggish brute. -Glad you're driving it, not me. in a 1994 TVR Chimaera. I tell you what, this is fantastic. and a beautiful bird in the passenger seat. Look at this! -I am not a beautiful bird. Don't say that to Margaret. Don't call her a bird. -No, I'll get a slap, won't I? -You will. She won't appreciate that. What do you think they'll be like? I don't know, I feel like I might get put in detention, or something. I wonder if they'll give us a challenge. I don't know. They might do, mightn't they? Like on The Apprentice. If it's not making a profit, that could challenge us. Well, that's the name of the game! ending in Cambridge where they'll punt for a profit at auction. it seems only fitting for the teams to meet up down by the quayside. Look at the size of that cruiser! -Does look grand, doesn't it? It is. I feel like we're going to meet royalty. You got almost into a space. I'm Catherine. Lovely to meet you. We were musing over what you might arrive in. -We had this imposed on us. Well we need to decide who's going to work with who. We were thinking boy-girl, boy-girl. Yeah, we've kind of decided, if you don't mind. MARGARET: Nick will always like being with a girl. And I'm relying 100% on you, because I know nothing about this. We are doomed, Margaret. We are doomed. Well, we'll enjoy ourselves, though, won't we? You'll have fun. We've got to walk. -You know we're quite competitive. -We've got to win this. That's what I like to hear. I love a bit of fighting spirit. En route to their first shop, Nick drops a bombshell. -I've got a notebook with me, and I'm marking you out of ten. and there's a correlation between your advice and whether it works or not. This is what I was dreading. like you do on The Apprentice! -I won't be around corners - I'll be right beside you with a notebook. Right, top of the game then, Catherine. -Shall I open the door? Peter, how do you do? -Hi, Peter. Good to see you. Time to declare war on the other team. Your kind of thing, Nick? There are times when I dearly wanted one of these. From guns to a pair of unusual metal vases. What are these? These are shell casings, are they? That's trench art. First World War. -Mm. Literally, they're 100 years old. -They weren't made in the trenches themselves. They were made behind the trenches in blacksmith shops and so on. It's... There's a sort of sadness about it. I know. When you think about what went on behind it. -It's not a thing of beauty, is it? -It's quirky, and there's a story. Spotted something you like, Catherine? Very clever - putting her hand over the price. Do you really like that? You do like that? Well, no, but I...I promised myself I would not tell you to buy anything. Because I know it could bite me on the bottom. Anyway, you know I am scoring you. And you'd tell me off. How much is it, by the way? -We're sort of trade, really. -Is that all you get? I thought you'd be quite good at this bargaining lark. Well, I haven't started yet. No, but is your background...? What is your background? -Is it maths? Is it accounts? "Well, if we take two of these, or three of these..."
Then you work out the best sort of deal, as a bundle. in the Old Curiosity Shop. and Philip's determined to sniff out the good bits. -That's what we like to hear! Well, special to us, certainly. What are those? I like glasses. That's the whole point about them. I thought... Yes. They're for mean hosts. while they are getting completely pickled. Because your glass will take about a quarter of theirs. it looks like you've got a full glass. Wouldn't it be better to give them to the guests, though. I would think 1820, 1840. Something like that. You can have those for 20 the pair. That's the marked price, though. We don't buy things at the marked price, do we? This lady is good, James. What about if we put a little parcel together, James? That might be the way forward. I've a good mind to take her to court about that. I think she might beat me. She knows a bit more than me. I think she knows a lot more than me. I quite like that - because they're plain. I don't like all this stuff with bits on them. -There you are, the MP's Garden of Verses. With apologies to... Must be Robert Louis Stevenson no less. James, I'm warming to you, by the minute. -Yeah, I do. I like this. Which is very roughly 12 and a half pence, isn't it, Margaret? I'll do the books and those then, at 25. There you are. I'll shake you by the hand. You're a gentleman. and a fiver for the books. Catherine has spotted something tucked high on a shelf. That might make us a bit of money. ..shimmy up there and bring it down? It will be flexible, too. And that's all original, legit and everything? Yeah. It's got one crack across the far side. Oh, yes. In the green. Do you mind if we head on down? this time for a ship called Aurora. Can I just ask you - these Aurora things...? Obviously, they were on the ship as, what...? They go along the railings, don't they? On the side of the gangway. -I think it's quite fun. Be great if he had a daughter called Aurora. -I was just thinking that! -You could put them on the pram! You'd have to have a pretty big pram. these gangplank signs have a high ticket price of £85. the stained glass window, and the Aurora signs. Their combined ticket prices are a whopping £413! Better get your bartering head on, Nick. So if we said 200, and we'll be out of your hair. You can say "200", but you won't get it for 200! -We'll get out of your hair. -I can't do it. I really can't. -No. I'll do 250 for the lot. -You can squeeze a little bit. Could you squeeze a tiny bit more? Because that will be wonderful for you to get rid of all of this. -My back is killing me. And I've got to heave it out to the car. You're going to get such a smacked bottom if that doesn't sell. 220, and then I won't get into so much trouble. Please. -He sounds exhausted, poor man. -I am! My legs have gone. No, not YOU - Peter! I'm not worried about you. all thanks to some bolshie bargaining. by blowing more than half their budget in the first shop. and are heading north to the pretty city of Salisbury. So, what are we going to buy in the next shop, in Salisbury? -and I hope we can find something a bit different. -Is it important to you? -Certainly do. Yeah, I want to beat Nick. That's the Road Trip spirit! Salisbury Cathedral has the tallest church spire in the UK. for fear the vibrations would bring down the tower! But it's not the cathedral that the team are here for. in the hunt of some hidden gems. Watch you don't trip over that, whatever it is. What on earth's this? A gong. -So they're all in an order, then. -I'm going to conduct. Are you ready? The one that you just hit! It's like The bloody Generation Game. It's not going very well here at all. But would anybody else want it? That's the question. Better get that business head back on and give Peter here a grilling. Have you got anything nice we could have cheaply and make some money on? I'll have a look in my cupboard and see what I've got. -Is this the special cupboard? Oh, look at this, eh? Ah! A box of assorted silver goodies. And not a ticket price to be seen. -Is that a pill box? and that would have had little pins and things in there. -Bits of a toy, or something. -Yeah. So this is like a little etui. -I would think it dates to, what, 1790? You'd have put perhaps needle cases, toothpicks in there. -He used to play inside left for Southampton. -Comes from round the corner. It's a nice little piece of antique silver. Right, come on, then, hit us with the bad news. -So what about if you put those two together? -That one and that one. made of horn, probably cow, with a rather lovely amethyst on the top. What's the best you can do for these, then? I could do the two for £90. -Have you no conscience at all? I'd pay you whatever you wanted for this stuff, if it was up to me. -But Margaret here, she's got a reputation to hold. -Have you seen her on The Apprentice? -But not in real life. -This is not real life. -The claws might have to come out. Meow! So, come on, then, is there a deal to be done? I think the very best we could do would be 50 quid for the two. -Would you meet me halfway? -Cos we said 40 to begin with. -Are we talking about for the two? -Yeah, and we have to try and make a profit on it. -60. I'll do it for 60. Go on, Margaret, work your charm. I've never been accused of having charm, I'm afraid. Looks like the wooing's up to you, then, Phil. I've always liked Peter. I don't know what you think. -Yeah, he's a nice man. -Been a genuine, straight bloke, hasn't he? -People have said round here what a lovely man he is. Really nice, lovely, kind man. -That's what they've said about him. -Do you think they're right, though? -I don't know. We might find out. As long as you don't tell anyone else. Trust me, no-one is ever going to know. No. Well, I won't tell. Shall I put it in a bag? Margaret, job's a good 'un. At £25 each, they've shaved £40 off the asking price. Now that's what I call doing a deal. Back in Southampton, Catherine and Nick have hit the road. -So, are you going to win this? There are bragging rights involved in this. -So we've got to win. The man who got the better of Margaret Mountford! -There's a trophy in there somewhere. -I think so. That would be good. He's clearly a man on a mission. This afternoon, Catherine and Nick are taking a break from shopping. -Where are we off to? -We're going to learn all about Spitfires. Do you know anything about Spitfires? Oh, that WILL be interesting! That's wonderful. It's the most beautiful aircraft. so this means quite a lot to me. after the funeral and do a victory roll. It was a terribly emotional moment. around 8,000 of which were built in the city. and its design was thanks to the late, great Reginald Mitchell. Telling them all about him is Andy. So, who was he? Where did he come from? and he came down to Southampton in about 1916. He'd been trained on the railways up in Stoke-on-Trent. must have been quite a difference. including the single-seat racing seaplane, the S6. "I want to design a beautiful-looking aeroplane". Everything about it is functional. that's the best aerodynamic shape you could come up with. -so they cool the water. so everything on it is functional. -so this aircraft is a precursor of the Spitfire. -was space-age to the public. got into that tiny, tiny cockpit. I must confess, I tried to get in it the other day myself. I'm not the slimmest of beasts by any means. but not that thin. It must have been absolutely awful. to develop a new technologically advanced fighter plane. You can see the family resemblance, that's for sure. -And very decisive, too, in the battle. and worried about the wings afterwards. Mitchell's approach was to design a thoroughbred, streamlined aeroplane. The pitch alters on the propeller. -and you're really getting maximum power through the engine. The design is incredible. He really did think of everything, didn't he? Oh, absolutely, all the way through. So, what year did Mitchell die? which was its finest hour. -that he didn't actually get to see that in battle? had he not been lost at such an early age. Reginald Mitchell, we salute you. it's time to say toodle-pip to the first day of the trip. The next morning. It's not even 9am, and already the bickering's begun. I'm coming out of the final shop without a penny. Well, that may not be the right tactic. Well, I don't care, that's what I'm doing. He who dares wins. -The winner takes it all. Any more cliches? -Give me a timid one. -Ooh, dear, I can't think of any. -Live to fight another day! He who laughs last laughs longest? Maybe that isn't quite apposite. -It's a straight road that has no turnings. -He digs deepest who deepest digs. Don't let Lord Sugar hear you speak like that. when it comes to spending. when they arrive at their next stop on the trip, Bath. We're in the same shop this morning. That's going to be a bit of fun. -I think it's an antique market. -That'll be like the boardroom. That will! We're going to be behind you, sneaking up, making notes. Well, that'll be a job, cos we'll be behind you. and has been put to good use. Are you all focused, ready to go? They haven't spent very much money yesterday. -Is the word "parsimonious"? Is that the word? MARGARET: Canny. Possibly canny. CATHERINE: Canny, yes. -So, which way are you going to head off? so plenty of treats for our teams to get their teeth into. -That's what you'd give us to take it away? Have you seen this lady perform? Catherine and Nick are getting creative. -How much is the easel? But I appreciate the fact that new it would cost...what? It would cost several hundred, I think, to get something like that. Well, no, I'll go along with it, actually. And I think, obviously, £75 is out of the question. £70 bottom price. And I'll hold it for you. -Will you hold that price for us for 30 minutes? -Thank you. We're not committed to buying it. But you're going to hold that price stable for 30 minutes. -By 12 o'clock, we will commit or walk away. -I'm frightened of you, Nick. Blimey! Nick certainly doesn't mess about. like spying on the other team. They're doing a deal over there. I can't see what it is, but they've got something. -Not Kentish Town, is it? -Ooh, I don't like that. That's horrible. -That looks like Nick on a bad day, doesn't it? from a horror movie is going to go down with Nick. MARGARET: Look what we've found. CATHERINE: What? I'm not so sure, but you reckon it is, do you? -She said it looks like Nick! -I tell you what, the colouring is an absolute match for you! -CATHERINE: You've got the wrinkles and the little chubby cheeks. Ritual humiliation over, Phil needs to get Margaret buying. -That sign, do you like that? -I like that German shoe sign, yeah. -How much is that poster? -Well, the very, very best price is £20. I think that's all right, don't you? "Only the shoemaker master warrants..."
It is finished, yeah. That's it. It is fragile, I warn you. So, that's another lot bought by Margaret. How's Catherine coping with her genial companion? He's got a stick now, he's quite frightening. He really means business with this. Ah, he's found a swagger stick, a symbol of military authority. Can we have a look at this? -because Margaret does not like that chest. -I don't like it very much. Neither does Phil by the look of it. -Right, that hasn't helped, has it? Sorry. -Does that make it worth more or less? Well, it's put a price on it, that is for sure. -It was going to be 45 until the end came off! -And I won't charge you for the damage. -What do you think, Margaret? it's just going to be problematic. -You're a good chap, thank you very much. -That's all right, you're welcome. -Let me just pay you. So a spot of sweet talking's got them the 19th century pine chest. -Do you have a second? -He's busy with us, actually. -What does that say about you? I mean, he means business. If we don't get our way he's going to be very cross today. -Yes, but you don't have to humour him, you know. but it's something like that. -All gong and no dinner. Now, now, children, play nice. Now, come on, what about this easel? Shall we deal with the easel? and we're very happy to do a deal and walk away. I think that's fair. I'll take the stick off you first. £65 is my last offer. Shall I put that back? I've now got the stick. -I'm going to give the stick to you. Does it come with all the paint, the, erm, paint pots? -Pots and the brushes, yes, it does. -And everything else in the shop? -Stall, everything on the stall. No, that's an extra £5, Nick. This is a swagger stick? It's a proper leather-covered swagger stick, yeah. What are we going to do with that? Why do we want this? Well, we can whack it in with the trench art. Trench art, good, love it. I like your style, Nick. Please could we have them all? 68.
and the easel and, erm, paint pots and brushes for £65. Looks like the other team have spotted a potential purchase too. -Er, I could do that one for 18. -What have we got we could put that with? -How much did you say? Can we put that with something? -Well, it's a model foot, isn't it? -It'd be a good doorstop. I thought that was rolling downhill then. Could you take 15 quid for it? -What do you want to do? -I think we should put it with the poster. It's a load of old cobblers. Pay the man, please. less than Nick and Catherine spent in their first shop. There's time now for a bit of exploring. That Margaret is one smart cookie. rather fascinating Roman artefacts that I know will tickle her fancy. So, they're heading off to the Roman baths. archaeological interest in the whole country. the Sacred Spring every year. being released, a bit like opening a bottle of fizzy pop. the work of ancient gods. as well as being an effective agent of curses. reserved for only the most rich and powerful. amazing artefacts, as manager Steven explains. It was found that all sorts of things had been thrown in as offerings. and then rolled or folded and thrown into the spring. And what they are, they're prayers. they're being retrieved for the goddess. -To give her an interest in doing it. each with their own message scratched into the metal in Latin. back in Roman times, mainly good old-fashioned thievery. A lot of the curses talk about things that are fairly modest objects. stolen them, er, should lose both his mind and his eyes. writing all that out for two gloves. on someone, but we don't know what the crime is cos that bit's missing. Roman baths because this is someone who's lost a bathing tunic. -"Er, actually, these aren't working?" in about the 5th century AD, that's when they stop being used. -This may be due to Christian influence, we don't know. But we don't know that they didn't work, do we? if they did we'd still be chucking them in, wouldn't we? aren't they? What on earth are they doing that for? things sort of tend to have to have values. I mean, where would you stand with these? Are they worth hundreds, thousands, tens of thousands? none has ever been sold. you could probably negotiate your way round one of these. armed with their remaining £112. And surprise-surprise, it's another sign that's turned their heads. -Oh, the Lyons' Tea sign? -Erm, that would be £130. What would your best price be, Caroline? Well, us poor shopkeepers, you know, it's a hard life. but that really is my rock bottom, truly. just for a walk around the shop? We'll come back with an answer. I think Nick's met his match in Caroline. -She's not moving, is she? I fear you could be right there, Catherine. Look, I'll tell you what, 100 for the sign, and then you can run away. -Shall we toss, yes or no? No, I think we need to make a decision that we're comfortable with. Catherine, I am tossing for it. Hold my stick. Oh, you're in control now. -Can we go for 95? -Heads, we buy it. There you go, £100. but it looks like the dirty work is being left to poor old Catherine. -Give me a chance to get there! -That's what I said, that's scratching. Well, that's enamel. But look at that. That comes off and that looks lovely, you see? D'you want to do some? My scrubbing days are over. -A bit more elbow grease at the bottom. ..taskmaster, aren't you? I bet Margaret's not doing this! Oh, I shouldn't think so for a minute! the perfect spot for our teams to compare their treasures. Oh, they've been round scrap metal shops, haven't they? You are just horrible, Philip Serrell, I don't love you anymore. -Don't fall out now, folks. An easel with a whole load of old paint on it. -Trench art, made in the trenches of the Somme. I think you probably should have stopped. -We've got an underground sign. How much was your Lyons' Tea sign? -How much d'you think we would have paid for that? No, we'd have gone 40 quid for that. -Yeah, we'd have gone definitely 40 quid. That's the patina, that makes it genuine, that's £100 worth. At trade that's going to go out for maybe £180, is that right? Right, OK, and how much is the easel? -The easel was a particularly good buy. we're not absolutely sure about that. And the pots, and the brushes. And the pots and the brushes? -Oh, well, that makes a huge difference! Let's see what you've got then, Margaret. I don't think he's impressed. - They were £5. - You said he was mean. - Parsimonious is the word. We've got a lovely little etui, silver. -Etui? Is it an etui? -Or is it a vesta case? -No, it's not a vesta case. - Can I pick this up? - Yeah, yeah, yeah. -You said he was mean, mean, mean. That is beautifully chased. No, it's lovely. -Yeah, we saw that. We saw that. This is mine, - a load of old cobblers, this is. And the shoe. The shoe was 15 and the poster was 20. Banter aside, what do they really think of the competition? -It's all a bit quirky, their stuff, isn't it? on things that perhaps I wouldn't have bought for that sort of money. Tell me we'll win. Catherine? I'm not that confident now because they spent so little. Overall, I think we've done OK, you know. I hope so. I'm relying on you! Come on. Well done, you, you've been top dollar. And I've absolutely thoroughly enjoyed it. It's been fun, and I hope we win. Well, they'll soon find out, as we're heading for auction. and motoring towards Cambridge for the big finale. So, predictions for the auction? -Oh, I think you'll win hands down. Because we just went all out and spent everything. for painted easels and ropy old trunks? -Yeah. I think they are. I'm not sure Nick will be when he knows the result. and is where Margaret herself studied in her youth. and Charles Ashton will be the man with the gavel. So, what does he make of our celebrities' lots? might just appeal to one of the Cambridge collectors. We were a little bit dubious when we saw the artist's easel. but you never know - it's an auction, anything could happen. and spent a bold £388 on six lots. While Margaret and Phil spent just £140, also on a total of six lots. First to the auction are Margaret and Nick. So, get the seats in. takes a turn for the worst. Let's hope the auction isn't going to be a wash-out. Better make a dash for it, Catherine. -Hello, Margaret, how are you? How are we looking? -Can we all squeeze in? You can park that big backside in there somewhere. -We're all squeezing in here. Is it to test this piece of furniture? Settle down, chaps, the auction is about to begin. It's like going to the pictures, isn't it? Let's hope it's as entertaining, Nick. First up are Margaret's MP joke book and alphabet book. £30 to start me, £30 for it. Be brave. 25, then. Come along. 25. - Ooh! - Get in, Margaret. 25 bid, now. 25 in the room it is. At 25 bid now, 25 it is. At 25, and 30. At the back, there, it's 30. 30 bid now. 35, sir? 35. That won't buy it. 35 is on my right. -I'm trying to hold my jaw up. The room is out elsewhere. At £35, and I shall sell by the cabinets over here at £35. Great start to the auction, giving Margaret a healthy lead. -That's a bit of a relief, isn't it? but, uh-oh, it's missing from the auction picture. Start me around about £30 for those, £30 to start off, I'd have thought. £30 and get on with it. Thank you, Ray. 30 I'm bid in the room now. At 30, I'm over there. -At 30 and bid now. At 30. -We need more than 30. At 30 I'm bid now, 30 bid now. At 30. -I'll take the five more. -35, and 40 in the room. 45. Whoops! I'm flying around here with excitement. 45 here bid now. 45, and 50 over there. At 50 bid now, at 50. In the room it is. At 50, bid at 50. In the room. Internet's out at £50, and I shall sell. All done then, away then. Nobody else? All finished at £50. If the swagger stick had been in there, made hundreds. Millions, I thought, actually. Millions. Yeah, right. A strong start for Nick, too - we have a competition. Can I have my swagger stick? No. You swagger enough. You don't need a stick. Time for Margaret's pair of 19th century illusion glasses. £30 to start me. 25, then. 25 twice over. 25 standing I took first. 25 there. At 25 bid now, 25. At 30 there, bid now, 30. 35, sir. 35 bid now. £35. At 35, who else is coming in? Who can I tempt? Anybody else? At £35, all done, then? Seen enough? I shall sell them at £35. I feel sick in my stomach. More profit for you. that nice little result pushes Margaret further into the lead. It's Nick's Aurora gang plank signs next and he's far from optimistic. Will you be cross with me, Nick? I could never be cross with you, Catherine. I'd be disappointed. I feel like you're my teacher! It'll say, "Could do better," on your report card. No, it would say, "Must do better." £30. 30 I'm bid down here, thank you. 30 I'm bid. 30 bid now, 30. At 30 bid. At 30. At 35, now. At 35, fresh blood, 35. And 40. I'm bid 50. 60 in the room now, 60 bid now. 60. -I knew there was something in it. Any more interest anywhere else? At 60, I've got 60. They're begging over here. Any more bids at all? At £60, here's your opportunity. Where are you? We need you. The hammer falls then at £60. All done, then, at 60? Catherine's got to be relieved about that little profit. I actually can't bear to see it. It's like I'm on a date at the cinema. Excuse me! because it's your Art Nouveau stained glass panel up now. -Well, on its side, actually. Who will start me for that? £30 now, I'm bid. Nice little Art Nouveau panel. Glass, leaded glass. 20, then, £20. £20 on my left, a bid now at 20. And five, 25? And 30. 30. £30, the bid's behind me now at 30. She shakes the head. At 30 bid now, 30 bid, 30. 35, new place. 35. No, sir. Thank you. At 35 bid, now, 35 bid. The bid's online now, at 35 bid now, 35 it is. A single panel. Nobody else tempted at all? At £35, then. -I think it was badly shown there. -It's the wrong way up. I think even Margaret's starting to feel sorry for Nick. because you've been friends a long time. -It's a very superficial friendship. -Yes, doesn't take much, does it? Margret's Scottish horn snuff box with the amethyst on top. I can begin at £20 for this, already bid. At 20, bid, now. 20 bid, now. 20. Anybody else now? At 25 bid now, £25. At 25, the bid now, 25. And 30. 30 bid, now, 30. Now it's your turn to come in. At 35 bid now, 35 the bid now, 35 it is. A £35, nobody else want it at all? At 35, all done, then? 40 bid, now, 40. At 40 bid, now, 40 bid now. and away at £40. At 40. Another tidy profit there for Margaret. Excellent. the effort, and the time that it took. -It was like a war of attrition. Nick sure needs to do well with his Kentish Town Underground sign. Come along, now, mind the gap! at 30 I'm bid now for Kentish Town enamel sign. At 30 I bid now, at 30 bid to start it off. At 30 I'm bid now, 30 bid now, 30. 35 over there. 35, and 40. 45, and 50. The bid's with me now, 50 bid now with me, 50. -At 50, and 60. 70. At 70, bid now, 70. At 70 bid now, 70 bid now. Where have you all gone now? The Kentish Town enamel sign, at £70. Any more or not, at 70? And 80. 80 bid now, 80. Another bidder. 80, I'm bid at 80, on at 80. Somebody's very keen. We have the Kentish Town supporters club here. At £80, then, all done, then? I shall sell. All done then at £80? That's unlucky, that is. That's just really unlucky. Unlucky? I'm not interested in unlucky! We're going down, here! If Lord Sugar was here, you know what he'd be saying, Nick. and thrown out of a window. I think you've encased yourself in concrete and jumped, actually. Don't get too cocky, Margaret. the German shoemaker's poster from 1930 the 19th-century elm shoe last. -I've got no idea. Will you tell me, who wants to bid me on these? £30, we're all buying. Thank you, Barbara, in the corner. At 30 in the corner, 30's in now. 30 bid, now, 30. 30 I have bid now. I'll take five more. Anybody else coming in? At £30, all done, then at £30, then? Margaret's first loss, but she's still well out in front of Nick. Don't let's burst into tears over it. No, no, we're not that upset, actually. -Now I know what you feel like. and it looks like Nick does, too. I don't think it's going to do anything. I've just got a feeling. Here we are, another curiosity lot here. -Absolutely. Couldn't say it better myself. -..the pots and the brushes. You don't often get there with the brushes as well. So, now's your chance. Anyway, a bit of interest I have. To start off at 30, 35, 40 I'm bid to begin. -At 40, I'm bid to start on, at 40 bid now, 40 bid. At 45. -Oh, well, I knew we'd done something right here. You were right! You were right, well done. At £120, the bid's with me. 120, one more might do it. 130. - You've just romped ahead here. - We've doubled. We've doubled. 130, I shall sell then. Left-handed, at 130. Thanks to Catherine's smart choice, you're back in the game, Nick. It shows, actually, Margaret, that I've got no idea about anything. -You are in excellent company, the pair of you. the 19th-century Dutch pine trunk that Phil broke. £50. 30. £30. 30, I'm bid. I thought somebody would bid be that. 30, I'm bid, across the room. At 30 I'm bid now. Thank you, Rosemary, at 30 bid over here. At 30 bid now, at 30. At 35, all right? 35. And 40. 40 bid, 40. 45. With 50. Like teeth. 50. It's like driving a sword into my sternum and stomach. I shall sell, then. Nobody else want it at £50? £50, it goes. It's eked a little bit of a profit, hasn't it? It's eked a bit of profit. I'd have paid more than that for it. As firewood, it'd be worth more than that. Not sure about that, Margaret. But still, a profit's a profit. bought on the toss of a coin. Nick said this would be on his head, remember? it's that I'd lose my shirt if I went into this business. £100 for that. 100. You tell me. £50, then? Put me in? 50? Thank you, Ray, 50 bid over there. At 50 I'm bid now. 50 bid, now, 50. At 50, bid now, at 50 bid, now, 50. For the enamel sign. And 60 online bid now, 60. And 70 in the room, bid now, 70 bid. 70. At 70 bid now, 70 bid, 70. And over here, at 80 bid now, at 80, Graham, at 80. -Come on, Graham, whoever Graham is. 90 bid, 90, 90. Graham, your turn again. 100 bid, now, 100 is in. At £100 bid now, at 100 bid, 100. You're out over there, Ray. Come on, Nick, get behind it. Come on! 110! -- It wasn't you bidding, was it? No, he says. With £110, then, all done? Nobody else? At 110 - but they're out, I'm afraid. At £110, 110. I think it's a good price, at 110, all done? £110, then. I think we'll get more, yeah. What did that sell for? So, his big gamble paid off. But it's not over yet for Margaret. There's still her silver Samuel Pemberton case to go. £50 for that, I would have thought for that, for 50. Put me in for that, the case, silver case, 50, or 40. Stop me and buy one, 40? 40 I'm bid down here, at 40. Thank you. At 40 and bid now, 40 bid. At 40. At 45, bid now, 45. At 45, bid now, at 45. And 50 I have here. At 50 bid now, at 50. At £50, it's going to go at 50. All done, then? Right-handed at the back. Finished then, at £50. -I thought we'd have got more than that for that. Well done, but it sort of deserves to be worth more. That's very gracious of you, Nick. Time to find out who is the winner. blowing almost all of it. Unfortunately, after auction costs, they made a loss of £6.70. So, they end the trip with £393.30. and spent less than half the budget. meaning they finish with £456.80, making them the rightful winners. All profits will go to Children In Need. So, with that result it means, Nick and Catherine, you're fired! -It's the end of a beautiful relationship. -If not a beautiful day. -It's been jolly good fun. It's been great, thank you. Oh, we've got a lake here! waltzed off with my swagger stick. -I'll buy you one for Christmas. -Are you going to do it again? I'm sure you high rollers will be welcomed back any old time. Cheerio. 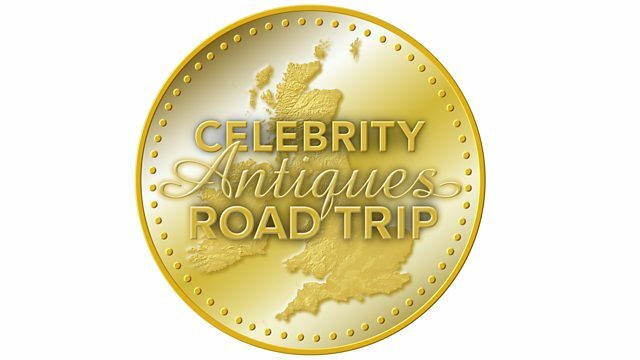 This edition of the celebrity antiques challenge sees the Apprentice stars Nick Hewer and Margaret Mountford become rivals as they travel around the south of England. Margaret and expert Phil Serrell are treated to a rare insight into life in Roman Britain, while Nick's no-nonsense antiques hunting keeps expert Catherine Southorn on her toes.